François Valentijn's Oud en Nieuw Oost-Indien (Old and New East Indies) has for long been regarded as a primary source of information on a number of regions of maritime Asia. It is a veritable encyclopaedia, bringing together an array of facts, trivial and vital, from a wide range of contemporary and earlier literature, acknowledged and unacknowledged, and contains valuable excerpts from contemporary documents of the Dutch East India Company and from private papers. It is indeed a public archive. Despite this historic character of the work, it was never republished in full in a critical edition or made available in English translation. It has therefore remained relatively unknown and little read, except by the specialist wanting to quarry this mine of information for his particular purpose. 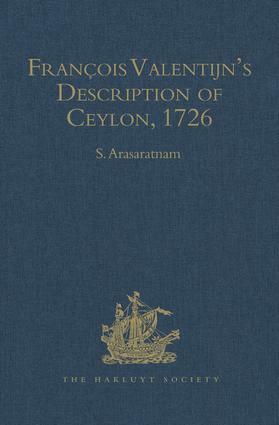 This edition of Valentijn embraces the part dealing with Ceylon (now Sri Lanka) in the fifth volume of Old and New East Indies. The island of Ceylon is one of three areas that has received the most detailed treatment in the work, with substantial sections devoted to geography, topography, society, natural history and the record of historical tradition. He also provides an almost contemporaneous account of the Dutch conquest of the island. For his description of Ceylon, Valentijn has had access to a variety of sources - Sinalese, Portuguese and Dutch - and has presented this material to us with his characteristic attention to detail. The volume now published with an introduction and explanatory notes is many things for many people: a geographer's manual, a naturalist's handbook, an anthropologist's collection of caste and custom, an antiquarian's record of tradition and a chronicler's narrative of history. One of the most informative writings on Ceylon is made available, for the first time, to the English-reading public.